Is an apple a first-level concept? How about a table? Doesn't a table depend on other concepts such as placement? What is the purpose of a table unless there's a need to keep other objects off the ground? What about a driver's license? It is a concept denoting perceptual concretes, whose meaning can be conveyed simply by pointing to a few concrete examples of it. The Lexicon excerpt quoted above explicitly describes the hierarchical status of "table." It is first-level, because it refers to perceptual concretes of a particular kind and can be understood and communicated ostensively, i.e., by pointing to concrete instances of it. The meaning of "table" itself does not depend on its placement or purpose. ITOE discusses "table" explicitly and identifies its essential distinguishing characteristics. What about a driver license? My understanding is that, first of all, this isn't proper English. The formal English expression is "driver's license," which means a license belonging to a driver. The expression is also not a single concept, but an expression comprised of two concepts: driver and license. I don't think either of those concepts would be considered first-level. One can point to a person, but to communicate or understand what "driver" means, one needs to understand the abstract relationship between the person and whatever vehicle he is "driving." Similarly, one can point to a card, but to communicate or understand what a "license" is, one needs to understand a great deal more that isn't perceptually evident. An adult definition of "table" would be: "A man-made object consisting of a flat, level surface and support(s), intended to support other, smaller objects." The "units" subsumed by a concept can be either directly perceivable concretes or previously formed concepts. In the former case, the concept is referred to as "first level," meaning a concept that is closest to the perceptual level of cognition. In the latter case, i.e., a concept that subsumes other concepts, the concept is referred to as "higher level," meaning farther removed from the perceptual level of cognition. Chapter 3 goes on to explain the processes of integration and differentiation (hierarchy of concepts) in great detail. I cannot begin to summarize all of that material more succinctly than Ayn Rand herself did in her own words, beyond highlighting a few key points directly related to the topic of this question. Regarding "birth certificate" (as in "certificate of birth"), it isn't a single concept. It's an expression comprised of two separate concepts: birth and certificate. One may argue that "birth" is a first-level concept, since it subsumes perceptually concrete processes which one can observe first-hand or in movies or videos, both in mammals of all kinds and in other animal species whose members hatch from eggs). "Certificate," however, is higher level (in my understanding), deriving from the concept of "certify," which presupposes a certifying authority (or owner) of some kind. I don't see how "certify" could be grasped perceptually in a way that truly comprehends what "certify" means. I also tend to agree that "document" is a higher level concept, perhaps a subdivision of "paper" (as in "a paper" or "a piece of paper"). I believe "document" could also be regarded as a subdivision of "writing" (as in "a writing"). One can certainly point to a document, but that doesn't convey what a "document" truly is (unlike the case with "table"). One needs to understand "a writing" and "on paper" to understand what a "document" is. "The meaning of "table" itself does not depend on its placement or purpose." Are you certain about that? What about chairs that have no backs? They can be interpreted as a table or a chair depending on how you use them. Evidently Ayn Rand did include a reference to intended function in her definition of "table." The objects shown in the photo actually look more like tables than chairs, and they look like they might not be level. 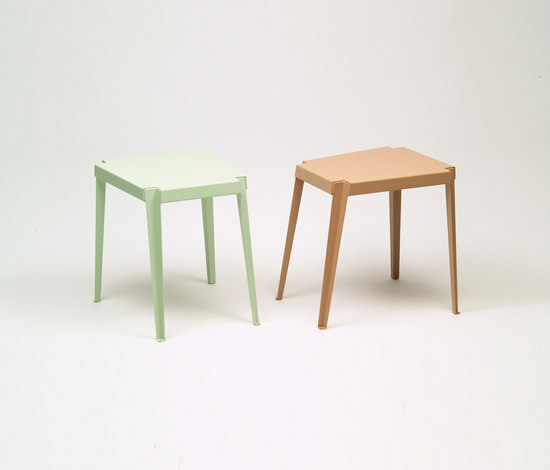 They actually seem closer to stools than to tables or typical chairs. A range of size measurements is also included within the meaning of a concept such as "table," which might differentiate most tables from the objects in the photo. So what exactly are the essential differentiators between a first-level concept and a non-first-level concept? Now that we've established that "intended function" can be used as part of the definition of a first-level concept, does this means that both a birth certificate and a driver's license, both being perceivable using our senses as "documents" with differences in intended function, are first-level concepts? "Document" is probably not a first-level concept if I use the example of "furniture" provided by Ayn Rand.